All Task IDs are defined at the system level in LANSA. If you have the appropriate authority, Task IDs can be created when logged on to any partition. The Lock functions to same task as process can be maintained on a LANSA for i Master LANSA System under the Task Tracking System Settings available from the Administration Menu. If this value is set to "Y", then all functions are required to be locked with the same Task ID as the parent process. If this value is set to "N" then functions within the same process may be locked to different tasks. This may be used when multiple developers using different tasks are working on functions in the same process. This setting is stored in the data area DC@OSVEROP as *TTG6FUNCLOCKING. A Process can be checked out as "Read only" and the function can be moved as "Update". This has the effect of checking out/ in the function without the process. Note: When Lock functions to same task as process is changed the system definition in Visual LANSA must be refreshed and the host monitor stopped and restarted. 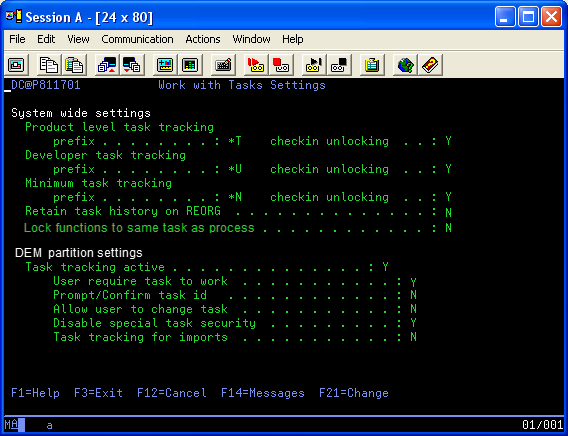 Refer to Task Tracking Settings in the LANSA for i User Guide. It is recommended that you use Task tracking in Visual LANSA. No specific system settings are required. For details about configuring a Visual LANSA Independent System, refer to Task Tracking on Independent Systems.